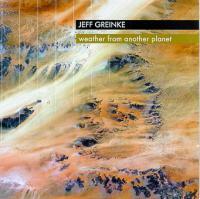 Jeff Greinke - "Weather From Another Planet"
This is Jeff’s second solo release for 2003. The other is ‘Wide View’, which I reviewed in AI #24. In the review for ‘Wide View’, I whined that Jeff has been moving away from the straight ambient stuff and has been adding looped percussion and other non-ambient stuffs. In fact, in a recent conversation he mentioned that ‘weather from another planet’ is very similar to his more recent work. To be honest, I wasn’t expecting much when I plopped this disc into the CD player. I mean, I’ll always like Jeff’s stuff, but truthfully I’m not a big fan of the direction that he was going. Please note the word “was”. As usual, it was a big surprise. I should know better than to prejudge, cause I’m pretty much wrong everytime. To me it sounds structured and bordering on the melodic and song-like. Jeff seems to have found a nice balance of rhythms and ambience; of textures and melodies. The nice thing is that not all the percussion is drum sounds. There are some nice instances of tuned percussion, giving the rhythms a smooth quality. The melody or lead sections are very soulful, with the lots of depth I’ve come to expect from Jeff’s ambient side. My final thought: I like it. It’s not ambient and it’s not the spacey rhythmic stuff. Unlike many of Jeff’s other works, it’s very accessible (to the masses). It also has a real polish to it, almost like a definitive statement. More than any other recording, this one should propel Jeff into the mainstream of electronic music artists. Now, if you were to ask me, “What is a good Jeff Greinke CD to start with?” I would recommend ‘weather from another planet’. For more information you can visit the Jeff Greinke web site at: http://www.hypnos.com/greinke. Weather From Another Planet is distributed by First World Music. You can visit their web site at: http://www.firstworldmusic.com.